The year 2011 just begun, but so far you can call it "The Year of Animals Dying in Mass." The year opened with thousands of birds falling from the sky Arkansas, Louisiana and Kentucky. Then fish were dying Illinois and Maryland. Now hundreds of cows in Wisconsin have been struck dead. Some 200 cows were found dead at a farm in Portage County, Wisconsin last Friday. But unlike those other animal deaths, its turns out there is a simple explanation for this one. According to preliminary results released this week, the cows died from acute interstitial pneumonia. Health officials say there is no risk of the pneumonia spreading to humans or the other animals on the farm. Still, no one knows how these cows became infected. Farm owner Jerry Krupka has a theory, though. "We had 2,000 bales of hay catch on fire here back in October. We had the fire department out, but everybody knows that a hay fire will not go out. It will smolder," he said. "There was smoke coming from that hay for 21/2 weeks, and that smoke blew over the cattle." Online theologian Paul Begley has a very different theory. He said it is a sign that the end of days is approaching. "There&apos;s something biblically going on with the signs of the second coming of Christ," Begley said in a video. However, judgment day is still a ways off. Begley said "we still need seven years of tribulation" and "the rise of the anti-Christ" before it all comes to an end. 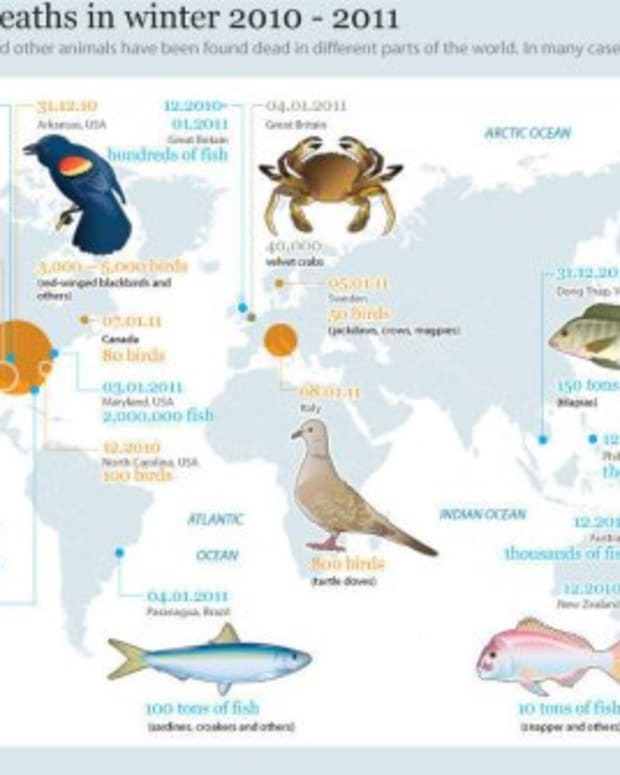 Why are Thousands of Birds, Fish and Crabs Dying? Armageddon? Why are Birds Falling from the Sky? Arkansas Bird Deaths Were Mass "Suicide"